I am so excited to be part of Michael's Craft Stores Pinterest parties! On Nov. 10th Michael's stores nation wide will be hosting Pinterest parties, encouraging everyone to "not just pin it- but make it!" Go to a Michael's store and tour their Pinterest inspired displays then join us in the classroom to create a pinterest-worthy project. It is going on from 1-4! And who is going to be in the classroom helping you out while you craft??? 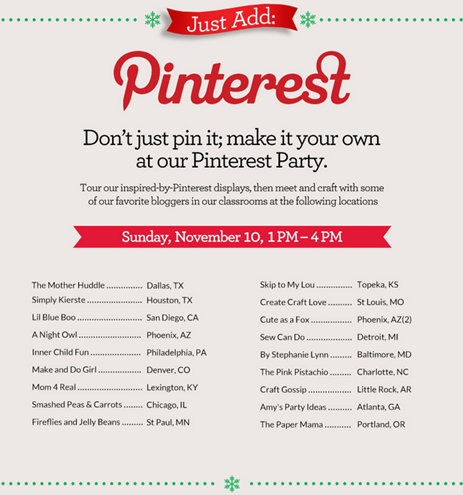 All your favorite bloggers will be helping host these parties nation wide... including me! Did you see Fireflies and Jellybeans on the list?? So, if you are in the Minneapolis/St. Paul area come and see me! I am going to be at the Maplewood store! I am so excited to meet some of you in real life!